About SkylarkPurpose built high quality bed and breakfast. 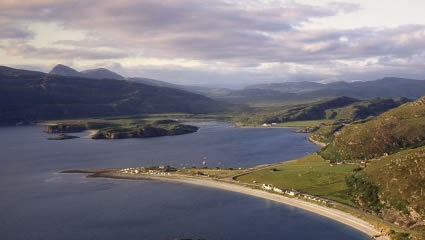 Skylark opened in 2013 to offer high quality bed and breakfast for visitors to Ullapool and the Highlands. Skylark proprietors, Karl and Pauline, have worked with the hospitality industry for a number of years and decided to build Skylark on family land overlooking the beautiful beach and bay at Ardmair, two miles north of the village of Ullapool. Skylark has been meticulously designed with guests needs and requirements in mind at all times. We have spacious parking, and the property is set back from the main road offering relaxing peace and quiet to unwind and enjoy the environment. Our rooms are large, comfortable and welcoming. Our en suite shower rooms have plenty of space to refresh yourself whether you have been travelling, out enjoying the countryside walking and climbing, or just touring around enjoying the Highlands. A choice of double or twin/family room(s). Tastefully furnished and designed to a high standard to make your stay a pleasant and enjoyable one. Our location, nestled into the hillside above Ardmair Bay, offers great views over the beach and bay, Isle Martin, Ben Mhor Coigach, and out to sea to the Summer Isles. The ever changing panoramic views can provide lightshow sunsets and even the occasional Northern Lights! We have a garden to the back of the property that guests are free to use and enjoy the clean invigorating air and environment that we are so lucky to live in. Please note, Skylark is a non-smoking premises, though guests may use the garden area if they wish. 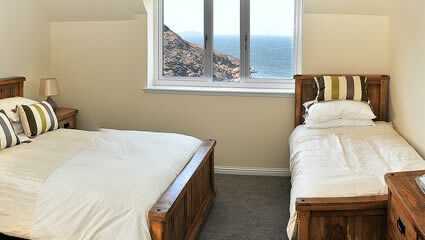 A choice of double or twin/family rooms. Tastefully furnished and designed to make your stay pleasant and enjoyable. We will do all we can to make you time with us pleasant. Wonderful Views over the bay and beach. A great location for exploring the region, stopping en route, or simply having a restful break. Be it one night or a longer stay, we aim to make your time with us pleasant and memorable and hope you will return again and again. 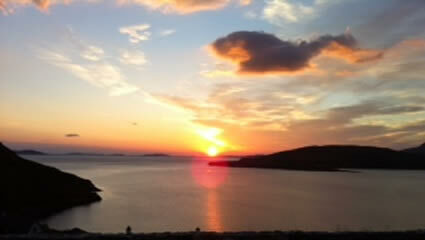 Watch the sun set over the sea and Summer Isles. The colours and environment change as you watch. The sea and beach below us provide a great spot to sit and watch nature go by, or even have a little fish or picnic. En suite spacious shower rooms. Only 2 miles from Ullapool.